In a city that's famous for its arcades and laneways, as well as being a creative hub, it comes as no surprise that Melbourne has some fascinating street art. It's no longer viewed as humble graffiti slapped up by bored teenagers, but rather as clever urban art, and undeniably a popular tourist attraction. One of the most well-known spots for street art, Hosier Lane, which is located just off Flinders Street, has become so much an attraction that it even featured in Tourism Victoria's Lose Yourself in Melbourne advertising campaign. The ever-evolving art is likely to have changed each time you visit. Anyone who knows me will tell you that possibly the last place you'll find me is in a dingy laneway admiring random street art. Truth be told, I discovered Hosier Lane when I popped into MoVida for some tapas and wine, which is, let's be honest, more my pace. But there's something unique about Hosier Lane that captures you - it has managed that awkward transformation from seedy alley to an authentically trendy hotspot. This is, in part, due to MoVida springing up on the corner, but it's mostly due to the layers of clever art along the brick walls. Locals of Melbourne CBD have become apt in recognising the signature of each artist, non-comformists whose work lines the underpasses and laneways of our city - and Hosier Lane is a perfect hybrid of it all. Heath Ledger as The Joker is my favourite, however there's plenty of other unusual pieces that are bound to catch your attention. The changing landscape of Hosier Lane is what makes it popular. Artists return and put new pieces over the current ones, ensuring that it stays lively and evolving, rather than always being the same each time you visit. 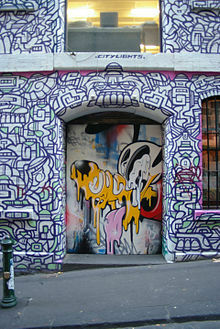 Hosier Lane is particularly noted for the quality of the art, which is often political in nature. 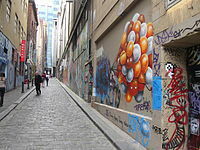 The laneway has featured in an episode of Masterchef Australia, and is a popular backdrop for Melbourne photography. We visited Hosier Lane in the evening, where we admired the art alongside a professional photographer, as well as two teenage girls taking action shots, obviously for an uber-cool Facebook profile photo. By night, you'll find throngs of people lining up to get into MoVida, so I suggest if you don't have a booking there, do as we did and slip into MoVida Nextdoor, which is located, conveniently, next door to the parent restaurant. It's a more casual setting, and you're welcome to sit up at the window, nibble some delicious tapas and have a wine, while you watch people from all walks of life admire the unusual art of Melbourne.